Jones Soda will celebrate 21 years of business this summer with the launch of the brand's first alcoholic hard cider-soda beverage out in the Pacific Northwest, where it will also be produced. 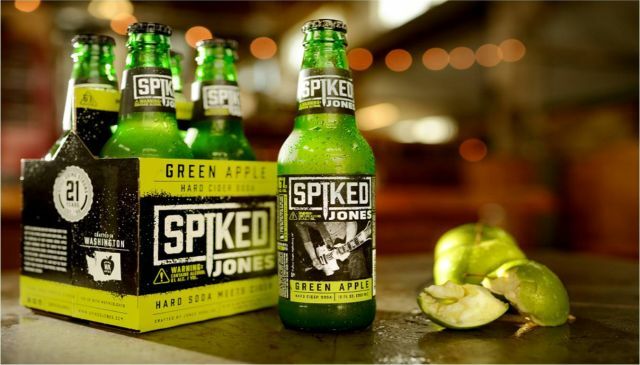 The new drink is called "Spiked Jones" and features a blend of hard cider, Washington apples, and the same natural flavors as is found in Jones' Green Apple Soda. It contains 6% alcohol by volume. According to the company, they've been thinking about making an alcoholic soda for years and actually filed the "Spiked Jones" name back in 1997. Photo via Jones Soda Co.